Everyone has heard of the worm at the bottom of a bottle of mezcal that is supposedly believed to contain aphrodisiac and hallucinogenic properties, but the worm larva doesn’t come out of the bottle to bite you. 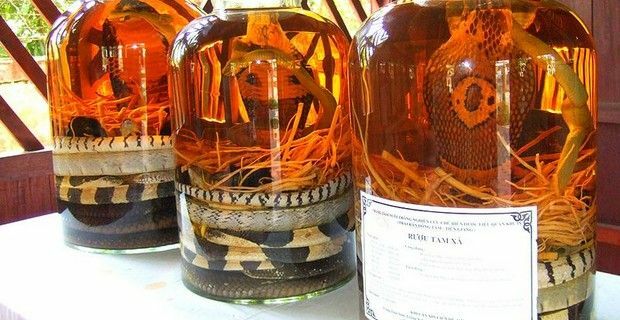 In China and some Southeast Asian countries some people use traditional snake wine called shejiu, that involves distilling a venomous snake in alcohol to cure various health ailments and is said to boost low libido and also longevity. The poisonous snake is left in the alcohol to ferment and break up its curative properties. However, in some cases the snake decides not to co-operate, and instead of pickling, the snake is able to survive by going into a state of hibernation by lowering its metabolism and heart rate, as one Chinese woman found out when she decided to pour herself a shot of three month old 'medicinal' wine. The woman that was identified as Liu from Shuangcheng in Heilongjiang Province, was using the pickled snake to treat her rheumatism, and was bit on the finger when the snake tried to escape, as she opened the bottle of wine to add more alcohol to it. It seems that this particular viper was able to remain alive for so long, because the container in which it was being pickled was not completely airtight. This is not the first incidentof a pickled snake being reported as coming back to life. One Mr. Zhang of Hubei Province was bitten by a snake in 2009 that had been preserved in a bottle of rice wine for two months, and in 2001, a villager from Guangxi Zhuang died a day after being bitten from a pickled snake.